The adaptive, or acquired, immune response takes days or even weeks to become established—much longer than the innate response; however, adaptive immunity is more specific to pathogens and has memory. Adaptive immunity is an immunity that occurs after exposure to an antigen either from a pathogen or a vaccination. This part of the immune system is activated when the innate immune response is insufficient to control an infection. In fact, without information from the innate immune system, the adaptive response could not be mobilized. There are two types of adaptive responses: the cell-mediated immune response, which is carried out by T cells, and the humoral immune response, which is controlled by activated B cells and antibodies. Activated T cells and B cells that are specific to molecular structures on the pathogen proliferate and attack the invading pathogen. Their attack can kill pathogens directly or secrete antibodies that enhance the phagocytosis of pathogens and disrupt the infection. Adaptive immunity also involves a memory to provide the host with long-term protection from reinfection with the same type of pathogen; on re-exposure, this memory will facilitate an efficient and quick response. Unlike NK cells of the innate immune system, B cells (B lymphocytes) are a type of white blood cell that gives rise to antibodies, whereas T cells (T lymphocytes) are a type of white blood cell that plays an important role in the immune response. T cells are a key component in the cell-mediated response—the specific immune response that utilizes T cells to neutralize cells that have been infected with viruses and certain bacteria. There are three types of T cells: cytotoxic, helper, and suppressor T cells. Cytotoxic T cells destroy virus-infected cells in the cell-mediated immune response, and helper T cells play a part in activating both the antibody and the cell-mediated immune responses. Suppressor T cells deactivate T cells and B cells when needed, and thus prevent the immune response from becoming too intense. An antigen is a foreign or “non-self” macromolecule that reacts with cells of the immune system. Not all antigens will provoke a response. For instance, individuals produce innumerable “self” antigens and are constantly exposed to harmless foreign antigens, such as food proteins, pollen, or dust components. The suppression of immune responses to harmless macromolecules is highly regulated and typically prevents processes that could be damaging to the host, known as tolerance. The innate immune system contains cells that detect potentially harmful antigens, and then inform the adaptive immune response about the presence of these antigens. An antigen-presenting cell (APC) is an immune cell that detects, engulfs, and informs the adaptive immune response about an infection. When a pathogen is detected, these APCs will phagocytose the pathogen and digest it to form many different fragments of the antigen. Antigen fragments will then be transported to the surface of the APC, where they will serve as an indicator to other immune cells. Dendritic cells are immune cells that process antigen material; they are present in the skin (Langerhans cells) and the lining of the nose, lungs, stomach, and intestines. Sometimes a dendritic cell presents on the surface of other cells to induce an immune response, thus functioning as an antigen-presenting cell. Macrophages also function as APCs. Before activation and differentiation, B cells can also function as APCs. Figure 1. An APC, such as a macrophage, engulfs and digests a foreign bacterium. An antigen from the bacterium is presented on the cell surface in conjunction with an MHC II molecule Lymphocytes of the adaptive immune response interact with antigen-embedded MHC II molecules to mature into functional immune cells. This animation from Rockefeller University shows how dendritic cells act as sentinels in the body’s immune system. 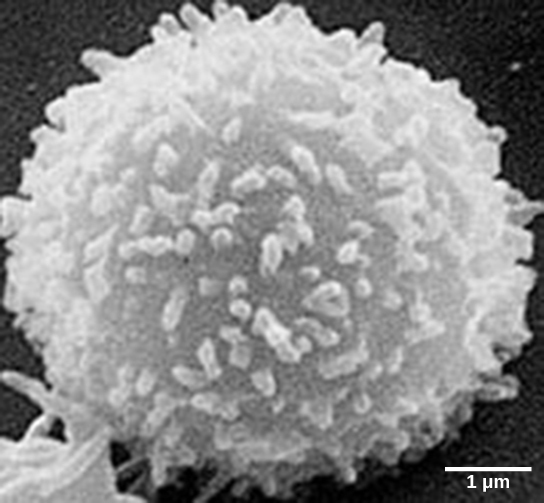 Lymphocytes in human circulating blood are approximately 80 to 90 percent T cells, shown in Figure 2, and 10 to 20 percent B cells. Recall that the T cells are involved in the cell-mediated immune response, whereas B cells are part of the humoral immune response. T cells encompass a heterogeneous population of cells with extremely diverse functions. Some T cells respond to APCs of the innate immune system, and indirectly induce immune responses by releasing cytokines. Other T cells stimulate B cells to prepare their own response. Another population of T cells detects APC signals and directly kills the infected cells. Other T cells are involved in suppressing inappropriate immune reactions to harmless or “self” antigens. 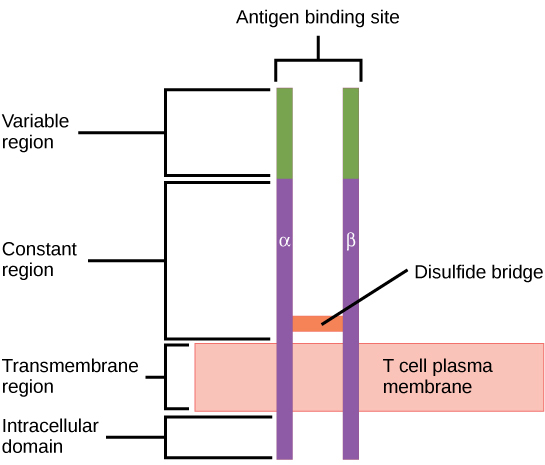 T and B cells exhibit a common theme of recognition/binding of specific antigens via a complementary receptor, followed by activation and self-amplification/maturation to specifically bind to the particular antigen of the infecting pathogen. T and B lymphocytes are also similar in that each cell only expresses one type of antigen receptor. Any individual may possess a population of T and B cells that together express a near limitless variety of antigen receptors that are capable of recognizing virtually any infecting pathogen. 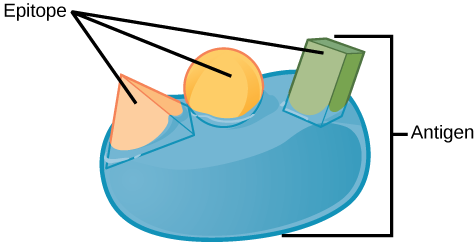 T and B cells are activated when they recognize small components of antigens, called epitopes, presented by APCs, illustrated in Figure 3. Figure 3. An antigen is a macromolecule that reacts with components of the immune system. A given antigen may contain several motifs that are recognized by immune cells. Each motif is an epitope. In this figure, the entire structure is an antigen, and the orange, salmon and green components projecting from it represent potential epitopes. Note that recognition occurs at a specific epitope rather than on the entire antigen; for this reason, epitopes are known as “antigenic determinants.” In the absence of information from APCs, T and B cells remain inactive, or naïve, and are unable to prepare an immune response. The requirement for information from the APCs of innate immunity to trigger B cell or T cell activation illustrates the essential nature of the innate immune response to the functioning of the entire immune system. 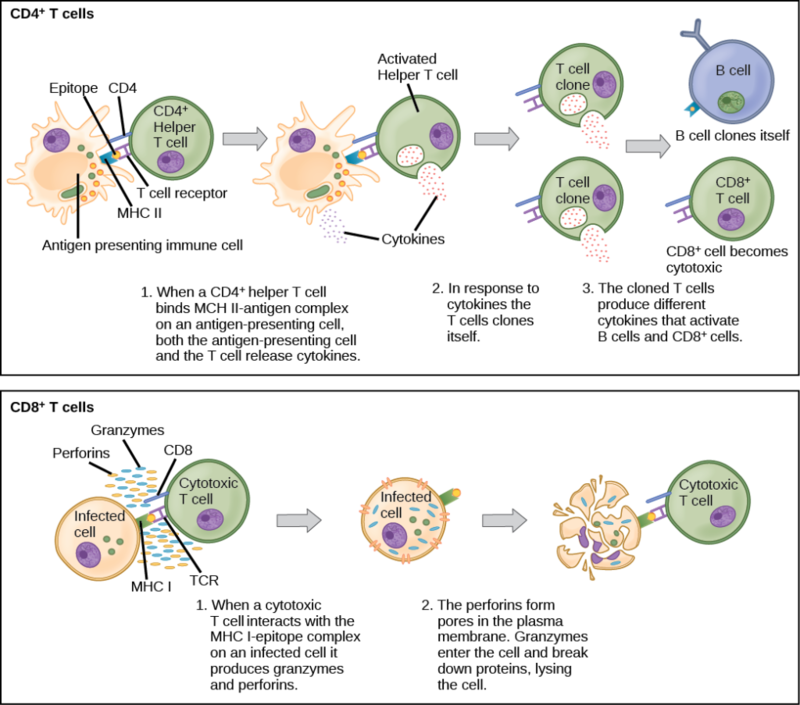 Naïve T cells can express one of two different molecules, CD4 or CD8, on their surface, as shown in Figure 4, and are accordingly classified as CD4+ or CD8+ cells. These molecules are important because they regulate how a T cell will interact with and respond to an APC. Naïve CD4+ cells bind APCs via their antigen-embedded MHC II molecules and are stimulated to become helper T (TH) lymphocytes, cells that go on to stimulate B cells (or cytotoxic T cells) directly or secrete cytokines to inform more and various target cells about the pathogenic threat. In contrast, CD8+ cells engage antigen-embedded MHC I molecules on APCs and are stimulated to become cytotoxic T lymphocytes (CTLs), which directly kill infected cells by apoptosis and emit cytokines to amplify the immune response. The two populations of T cells have different mechanisms of immune protection, but both bind MHC molecules via their antigen receptors called T cell receptors (TCRs). The CD4 or CD8 surface molecules differentiate whether the TCR will engage an MHC II or an MHC I molecule. Because they assist in binding specificity, the CD4 and CD8 molecules are described as coreceptors. Figure 4. Naïve CD4+ T cells engage MHC II molecules on antigen-presenting cells (APCs) and become activated. Clones of the activated helper T cell, in turn, activate B cells and CD8+ T cells, which become cytotoxic T cells. Cytotoxic T cells kill infected cells. Which of the following statements about T cells is false? Helper T cells release cytokines while cytotoxic T cells kill the infected cell. Helper T cells are CD4+, while cytotoxic T cells are CD8+. MHC II is a receptor found on most body cells, while MHC I is a receptor found on immune cells only. The T cell receptor is found on both CD4+ and CD8+ T cells. Figure 5. A T cell receptor spans the membrane and projects variable binding regions into the extracellular space to bind processed antigens via MHC molecules on APCs. Consider the innumerable possible antigens that an individual will be exposed to during a lifetime. The mammalian adaptive immune system is adept in responding appropriately to each antigen. Mammals have an enormous diversity of T cell populations, resulting from the diversity of TCRs. Each TCR consists of two polypeptide chains that span the T cell membrane, as illustrated in Figure 5; the chains are linked by a disulfide bridge. Each polypeptide chain is comprised of a constant domain and a variable domain: a domain, in this sense, is a specific region of a protein that may be regulatory or structural. The intracellular domain is involved in intracellular signaling. A single T cell will express thousands of identical copies of one specific TCR variant on its cell surface. The specificity of the adaptive immune system occurs because it synthesizes millions of different T cell populations, each expressing a TCR that differs in its variable domain. This TCR diversity is achieved by the mutation and recombination of genes that encode these receptors in stem cell precursors of T cells. The binding between an antigen-displaying MHC molecule and a complementary TCR “match” indicates that the adaptive immune system needs to activate and produce that specific T cell because its structure is appropriate to recognize and destroy the invading pathogen. The TH lymphocytes function indirectly to identify potential pathogens for other cells of the immune system. These cells are important for extracellular infections, such as those caused by certain bacteria, helminths, and protozoa. TH lymphocytes recognize specific antigens displayed in the MHC II complexes of APCs. There are two major populations of TH cells: TH1 and TH2. TH1 cells secrete cytokines to enhance the activities of macrophages and other T cells. TH1 cells activate the action of cyotoxic T cells, as well as macrophages. TH2 cells stimulate naïve B cells to destroy foreign invaders via antibody secretion. Whether a TH1 or a TH2 immune response develops depends on the specific types of cytokines secreted by cells of the innate immune system, which in turn depends on the nature of the invading pathogen. The TH1-mediated response involves macrophages and is associated with inflammation. Recall the frontline defenses of macrophages involved in the innate immune response. Some intracellular bacteria, such as Mycobacterium tuberculosis, have evolved to multiply in macrophages after they have been engulfed. 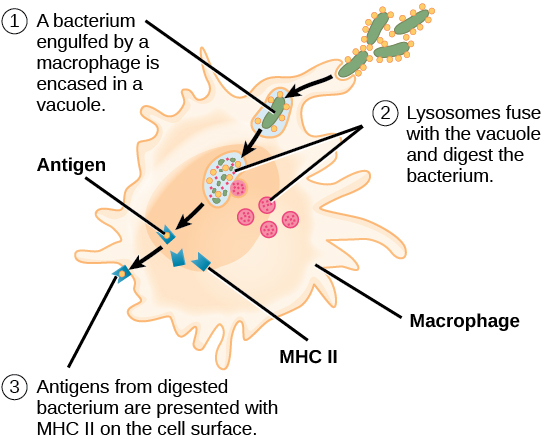 These pathogens evade attempts by macrophages to destroy and digest the pathogen. When M. tuberculosis infection occurs, macrophages can stimulate naïve T cells to become TH1 cells. These stimulated T cells secrete specific cytokines that send feedback to the macrophage to stimulate its digestive capabilities and allow it to destroy the colonizing M. tuberculosis. In the same manner, TH1-activated macrophages also become better suited to ingest and kill tumor cells. In summary; TH1 responses are directed toward intracellular invaders while TH2 responses are aimed at those that are extracellular. Figure 6. B cell receptors are embedded in the membranes of B cells and bind a variety of antigens through their variable regions. The signal transduction region transfers the signal into the cell. When stimulated by the TH2 pathway, naïve B cells differentiate into antibody-secreting plasma cells. A plasma cell is an immune cell that secrets antibodies; these cells arise from B cells that were stimulated by antigens. 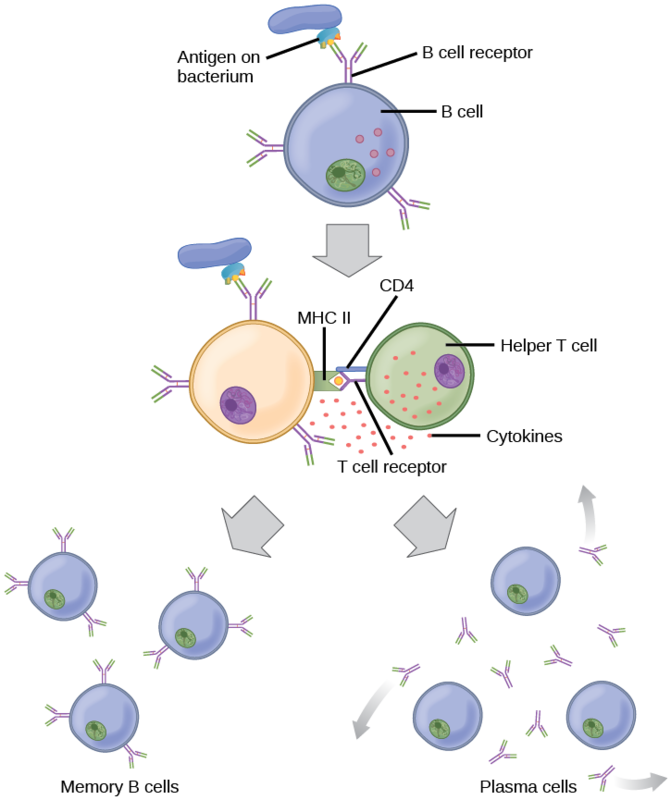 Similar to T cells, naïve B cells initially are coated in thousands of B cell receptors (BCRs), which are membrane-bound forms of Ig (immunoglobulin, or an antibody). 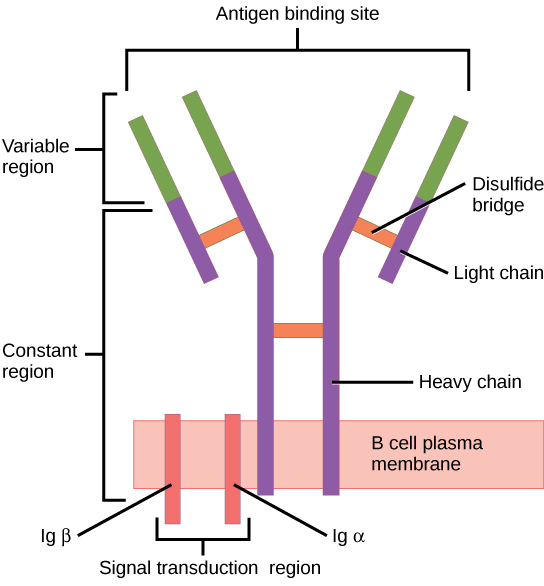 The B cell receptor has two heavy chains and two light chains connected by disulfide linkages. Each chain has a constant and a variable region; the latter is involved in antigen binding. Two other membrane proteins, Ig alpha and Ig beta, are involved in signaling. The receptors of any particular B cell, as shown in Figure 6 are all the same, but the hundreds of millions of different B cells in an individual have distinct recognition domains that contribute to extensive diversity in the types of molecular structures to which they can bind. In this state, B cells function as APCs. They bind and engulf foreign antigens via their BCRs and then display processed antigens in the context of MHC II molecules to TH2 cells. When a TH2 cell detects that a B cell is bound to a relevant antigen, it secretes specific cytokines that induce the B cell to proliferate rapidly, which makes thousands of identical (clonal) copies of it, and then it synthesizes and secretes antibodies with the same antigen recognition pattern as the BCRs. The activation of B cells corresponding to one specific BCR variant and the dramatic proliferation of that variant is known as clonal selection. This phenomenon drastically, but briefly, changes the proportions of BCR variants expressed by the immune system, and shifts the balance toward BCRs specific to the infecting pathogen. T and B cells differ in one fundamental way: whereas T cells bind antigens that have been digested and embedded in MHC molecules by APCs, B cells function as APCs that bind intact antigens that have not been processed. Although T and B cells both react with molecules that are termed “antigens,” these lymphocytes actually respond to very different types of molecules. B cells must be able to bind intact antigens because they secrete antibodies that must recognize the pathogen directly, rather than digested remnants of the pathogen. Bacterial carbohydrate and lipid molecules can activate B cells independently from the T cells. CTLs, a subclass of T cells, function to clear infections directly. The cell-mediated part of the adaptive immune system consists of CTLs that attack and destroy infected cells. CTLs are particularly important in protecting against viral infections; this is because viruses replicate within cells where they are shielded from extracellular contact with circulating antibodies. When APCs phagocytize pathogens and present MHC I-embedded antigens to naïve CD8+ T cells that express complementary TCRs, the CD8+ T cells become activated to proliferate according to clonal selection. These resulting CTLs then identify non-APCs displaying the same MHC I-embedded antigens (for example, viral proteins)—for example, the CTLs identify infected host cells. Intracellularly, infected cells typically die after the infecting pathogen replicates to a sufficient concentration and lyses the cell, as many viruses do. CTLs attempt to identify and destroy infected cells before the pathogen can replicate and escape, thereby halting the progression of intracellular infections. CTLs also support NK lymphocytes to destroy early cancers. Cytokines secreted by the TH1 response that stimulates macrophages also stimulate CTLs and enhance their ability to identify and destroy infected cells and tumors. CTLs sense MHC I-embedded antigens by directly interacting with infected cells via their TCRs. Binding of TCRs with antigens activates CTLs to release perforin and granzyme, degradative enzymes that will induce apoptosis of the infected cell. Recall that this is a similar destruction mechanism to that used by NK cells. In this process, the CTL does not become infected and is not harmed by the secretion of perforin and granzymes. In fact, the functions of NK cells and CTLs are complementary and maximize the removal of infected cells, as illustrated in Figure 7. If the NK cell cannot identify the “missing self” pattern of down-regulated MHC I molecules, then the CTL can identify it by the complex of MHC I with foreign antigens, which signals “altered self.” Similarly, if the CTL cannot detect antigen-embedded MHC I because the receptors are depleted from the cell surface, NK cells will destroy the cell instead. CTLs also emit cytokines, such as interferons, that alter surface protein expression in other infected cells, such that the infected cells can be easily identified and destroyed. Moreover, these interferons can also prevent virally infected cells from releasing virus particles. Figure 7. 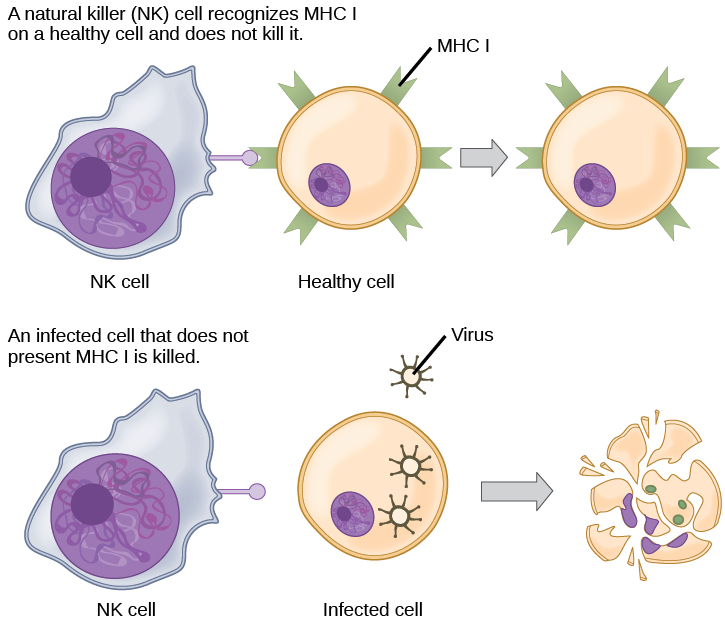 Natural killer (NK) cells recognize the MHC I receptor on healthy cells. If MHC I is absent, the cell is lysed. Based on what you know about MHC receptors, why do you think an organ transplanted from an incompatible donor to a recipient will be rejected? MHC receptors differ from person to person. Thus, MHC receptors on an incompatible donor are considered “non-self” and are rejected by the immune system. Plasma cells and CTLs are collectively called effector cells: they represent differentiated versions of their naïve counterparts, and they are involved in bringing about the immune defense of killing pathogens and infected host cells. Figure 8. Click for a larger image. The topology and function of intestinal MALT is shown. Pathogens are taken up by M cells in the intestinal epithelium and excreted into a pocket formed by the inner surface of the cell. The pocket contains antigen-presenting cells such as dendritic cells, which engulf the antigens, then present them with MHC II molecules on the cell surface. The dendritic cells migrate to an underlying tissue called a Peyer’s patch. Antigen-presenting cells, T cells, and B cells aggregate within the Peyer’s patch, forming organized lymphoid follicles. There, some T cells and B cells are activated. Other antigen-loaded dendritic cells migrate through the lymphatic system where they activate B cells, T cells, and plasma cells in the lymph nodes. The activated cells then return to MALT tissue effector sites. IgA and other antibodies are secreted into the intestinal lumen. The innate and adaptive immune responses discussed thus far comprise the systemic immune system (affecting the whole body), which is distinct from the mucosal immune system. 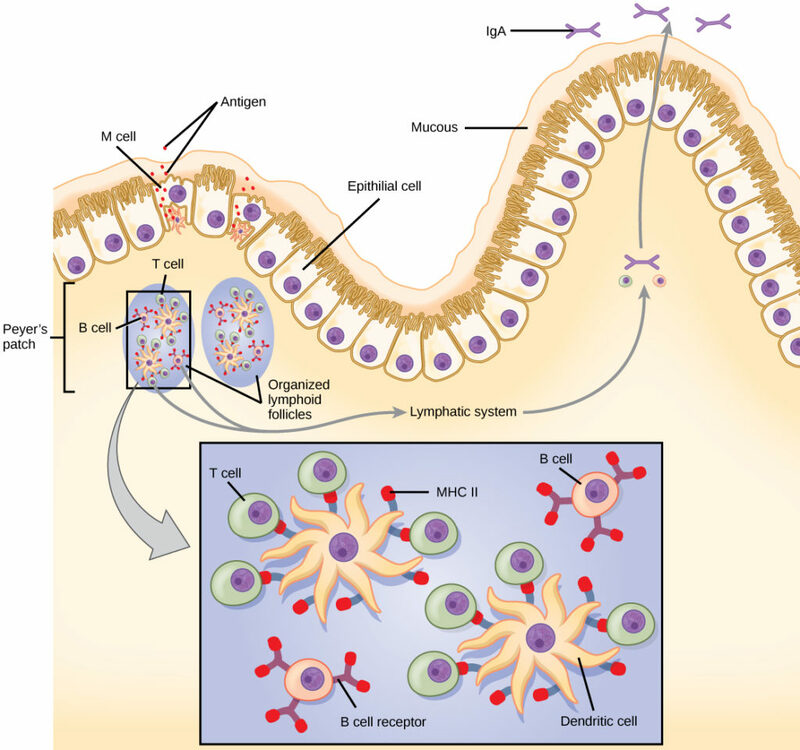 Mucosal immunity is formed by mucosa-associated lymphoid tissue, which functions independently of the systemic immune system, and which has its own innate and adaptive components. Mucosa-associated lymphoid tissue (MALT), illustrated in Figure 8, is a collection of lymphatic tissue that combines with epithelial tissue lining the mucosa throughout the body. This tissue functions as the immune barrier and response in areas of the body with direct contact to the external environment. The systemic and mucosal immune systems use many of the same cell types. Foreign particles that make their way to MALT are taken up by absorptive epithelial cells called M cells and delivered to APCs located directly below the mucosal tissue. M cells function in the transport described, and are located in the Peyer’s patch, a lymphoid nodule. APCs of the mucosal immune system are primarily dendritic cells, with B cells and macrophages having minor roles. Processed antigens displayed on APCs are detected by T cells in the MALT and at various mucosal induction sites, such as the tonsils, adenoids, appendix, or the mesenteric lymph nodes of the intestine. Activated T cells then migrate through the lymphatic system and into the circulatory system to mucosal sites of infection. MALT is a crucial component of a functional immune system because mucosal surfaces, such as the nasal passages, are the first tissues onto which inhaled or ingested pathogens are deposited. The mucosal tissue includes the mouth, pharynx, and esophagus, and the gastrointestinal, respiratory, and urogenital tracts. The immune system has to be regulated to prevent wasteful, unnecessary responses to harmless substances, and more importantly so that it does not attack “self.” The acquired ability to prevent an unnecessary or harmful immune response to a detected foreign substance known not to cause disease is described as immune tolerance. Immune tolerance is crucial for maintaining mucosal homeostasis given the tremendous number of foreign substances (such as food proteins) that APCs of the oral cavity, pharynx, and gastrointestinal mucosa encounter. Immune tolerance is brought about by specialized APCs in the liver, lymph nodes, small intestine, and lung that present harmless antigens to an exceptionally diverse population of regulatory T (Treg) cells, specialized lymphocytes that suppress local inflammation and inhibit the secretion of stimulatory immune factors. The combined result of Treg cells is to prevent immunologic activation and inflammation in undesired tissue compartments and to allow the immune system to focus on pathogens instead. In addition to promoting immune tolerance of harmless antigens, other subsets of Treg cells are involved in the prevention of the autoimmune response, which is an inappropriate immune response to host cells or self-antigens. Another Treg class suppresses immune responses to harmful pathogens after the infection has cleared to minimize host cell damage induced by inflammation and cell lysis. The adaptive immune system possesses a memory component that allows for an efficient and dramatic response upon reinvasion of the same pathogen. Memory is handled by the adaptive immune system with little reliance on cues from the innate response. During the adaptive immune response to a pathogen that has not been encountered before, called a primary response, plasma cells secreting antibodies and differentiated T cells increase, then plateau over time. As B and T cells mature into effector cells, a subset of the naïve populations differentiates into B and T memory cells with the same antigen specificities, as illustrated in Figure 9. A memory cell is an antigen-specific B or T lymphocyte that does not differentiate into effector cells during the primary immune response, but that can immediately become effector cells upon re-exposure to the same pathogen. During the primary immune response, memory cells do not respond to antigens and do not contribute to host defenses. As the infection is cleared and pathogenic stimuli subside, the effectors are no longer needed, and they undergo apoptosis. In contrast, the memory cells persist in the circulation. Figure 9. After initially binding an antigen to the B cell receptor (BCR), a B cell internalizes the antigen and presents it on MHC II. A helper T cell recognizes the MHC II–antigen complex and activates the B cell. As a result, memory B cells and plasma cells are made. If the blood of the mother and fetus mixes, memory cells that recognize the Rh antigen can form late in the first pregnancy. During subsequent pregnancies, these memory cells launch an immune attack on the fetal blood cells. Injection of anti-Rh antibody during the first pregnancy prevents the immune response from occurring. If the pathogen is never encountered again during the individual’s lifetime, B and T memory cells will circulate for a few years or even several decades and will gradually die off, having never functioned as effector cells. However, if the host is re-exposed to the same pathogen type, circulating memory cells will immediately differentiate into plasma cells and CTLs without input from APCs or TH cells. One reason the adaptive immune response is delayed is because it takes time for naïve B and T cells with the appropriate antigen specificities to be identified and activated. Upon reinfection, this step is skipped, and the result is a more rapid production of immune defenses. 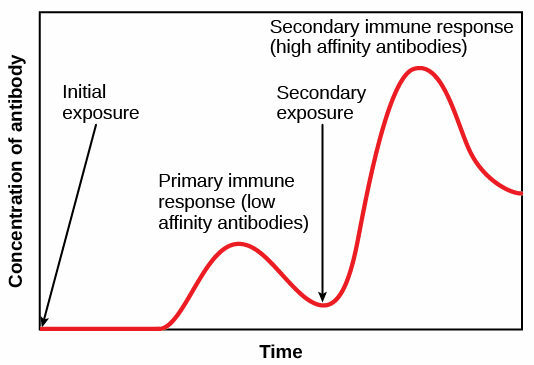 Memory B cells that differentiate into plasma cells output tens to hundreds-fold greater antibody amounts than were secreted during the primary response, as the graph in Figure 10 illustrates. This rapid and dramatic antibody response may stop the infection before it can even become established, and the individual may not realize they had been exposed. Figure 10. In the primary response to infection, antibodies are secreted first from plasma cells. Upon re-exposure to the same pathogen, memory cells differentiate into antibody-secreting plasma cells that output a greater amount of antibody for a longer period of time. Vaccination is based on the knowledge that exposure to noninfectious antigens, derived from known pathogens, generates a mild primary immune response. The immune response to vaccination may not be perceived by the host as illness but still confers immune memory. When exposed to the corresponding pathogen to which an individual was vaccinated, the reaction is similar to a secondary exposure. Because each reinfection generates more memory cells and increased resistance to the pathogen, and because some memory cells die, certain vaccine courses involve one or more booster vaccinations to mimic repeat exposures: for instance, tetanus boosters are necessary every ten years because the memory cells only live that long. A subset of T and B cells of the mucosal immune system differentiates into memory cells just as in the systemic immune system. Upon reinvasion of the same pathogen type, a pronounced immune response occurs at the mucosal site where the original pathogen deposited, but a collective defense is also organized within interconnected or adjacent mucosal tissue. For instance, the immune memory of an infection in the oral cavity would also elicit a response in the pharynx if the oral cavity was exposed to the same pathogen. Vaccination (or immunization) involves the delivery, usually by injection as shown in Figure 11a, of noninfectious antigen(s) derived from known pathogens. Other components, called adjuvants, are delivered in parallel to help stimulate the immune response. Immunological memory is the reason vaccines work. Ideally, the effect of vaccination is to elicit immunological memory, and thus resistance to specific pathogens without the individual having to experience an infection. Vaccinologists are involved in the process of vaccine development from the initial idea to the availability of the completed vaccine. This process can take decades, can cost millions of dollars, and can involve many obstacles along the way. For instance, injected vaccines stimulate the systemic immune system, eliciting humoral and cell-mediated immunity, but have little effect on the mucosal response, which presents a challenge because many pathogens are deposited and replicate in mucosal compartments, and the injection does not provide the most efficient immune memory for these disease agents. For this reason, vaccinologists are actively involved in developing new vaccines that are applied via intranasal, aerosol, oral, or transcutaneous (absorbed through the skin) delivery methods. Importantly, mucosal-administered vaccines elicit both mucosal and systemic immunity and produce the same level of disease resistance as injected vaccines. 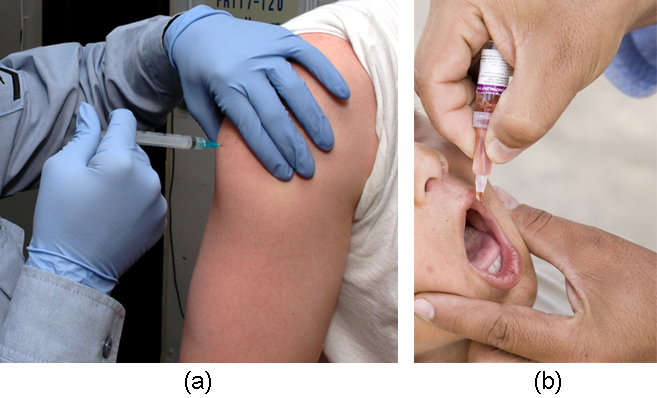 Currently, a version of intranasal influenza vaccine is available, and the polio and typhoid vaccines can be administered orally, as shown in Figure 11b. Similarly, the measles and rubella vaccines are being adapted to aerosol delivery using inhalation devices. Eventually, transgenic plants may be engineered to produce vaccine antigens that can be eaten to confer disease resistance. Other vaccines may be adapted to rectal or vaginal application to elicit immune responses in rectal, genitourinary, or reproductive mucosa. Finally, vaccine antigens may be adapted to transdermal application in which the skin is lightly scraped and microneedles are used to pierce the outermost layer. In addition to mobilizing the mucosal immune response, this new generation of vaccines may end the anxiety associated with injections and, in turn, improve patient participation. Although the immune system is characterized by circulating cells throughout the body, the regulation, maturation, and intercommunication of immune factors occur at specific sites. The blood circulates immune cells, proteins, and other factors through the body. Approximately 0.1 percent of all cells in the blood are leukocytes, which encompass monocytes (the precursor of macrophages) and lymphocytes. The majority of cells in the blood are erythrocytes (red blood cells). Lymph is a watery fluid that bathes tissues and organs with protective white blood cells and does not contain erythrocytes. Cells of the immune system can travel between the distinct lymphatic and blood circulatory systems, which are separated by interstitial space, by a process called extravasation (passing through to surrounding tissue). The cells of the immune system originate from hematopoietic stem cells in the bone marrow. Cytokines stimulate these stem cells to differentiate into immune cells. B cell maturation occurs in the bone marrow, whereas naïve T cells transit from the bone marrow to the thymus for maturation. In the thymus, immature T cells that express TCRs complementary to self-antigens are destroyed. This process helps prevent autoimmune responses. On maturation, T and B lymphocytes circulate to various destinations. Lymph nodes scattered throughout the body, as illustrated in Figure 13, house large populations of T and B cells, dendritic cells, and macrophages. Lymph gathers antigens as it drains from tissues. These antigens then are filtered through lymph nodes before the lymph is returned to circulation. APCs in the lymph nodes capture and process antigens and inform nearby lymphocytes about potential pathogens. The spleen houses B and T cells, macrophages, dendritic cells, and NK cells. 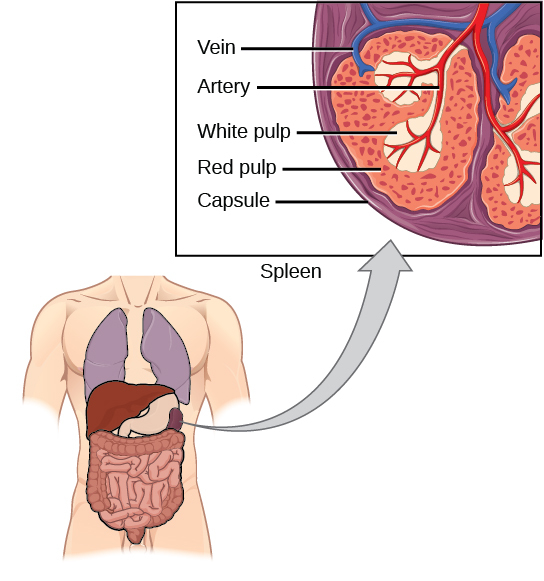 The spleen, shown in Figure 14, is the site where APCs that have trapped foreign particles in the blood can communicate with lymphocytes. Antibodies are synthesized and secreted by activated plasma cells in the spleen, and the spleen filters foreign substances and antibody-complexed pathogens from the blood. Functionally, the spleen is to the blood as lymph nodes are to the lymph. The adaptive immune response is a slower-acting, longer-lasting, and more specific response than the innate response. However, the adaptive response requires information from the innate immune system to function. APCs display antigens via MHC molecules to complementary naïve T cells. In response, the T cells differentiate and proliferate, becoming TH cells or CTLs. TH cells stimulate B cells that have engulfed and presented pathogen-derived antigens. B cells differentiate into plasma cells that secrete antibodies, whereas CTLs induce apoptosis in intracellularly infected or cancerous cells. Memory cells persist after a primary exposure to a pathogen. If re-exposure occurs, memory cells differentiate into effector cells without input from the innate immune system. The mucosal immune system is largely independent from the systemic immune system but functions in a parallel fashion to protect the extensive mucosal surfaces of the body.